Sadly Mutleythedogsdayout author has passed away in his sleep at the age of 46. Mutley the dog was quite a regular commenter at Capitalists@work, with his humorous observations and perceptive comments. His own blog was a great joy to visit with its madcap events in a strangely surreal comedic fantasy land. He will be sadly missed by his many followers. I well remember when Mutley got started: as with many folk, in the comments on Guido, back in 2006. From nowhere, he grabbed instant attention with a burst of surreal invention to which our old friend Tuscan Tony, and the infamous "Peter Hitchens" immediately responded in kind, to memorable effect. Cityunslicker adds: Bugger. I can only add to the above, what a great blogger Robert was. His discussions on the work of radioactive howler monkeys will bring on tears of laughter in me forever. It is very sad news. Amen to that. Great post for our beloved friend. That is simply awful. A man who managed to get lemons and turn them into extraordinarily witty pieces. Dreadful news. My thoughts are with his family. Mutley's was one of the most creative, humourous and imaginative voices in BlogsVille. Thank you for this tribute to his memory. Do you remember his odyssy with a skeleton as a travelling companion and a mischevous Tasmanian Devil living in its skull ? Always getting him in trouble with his risky comments ??? I did alert the BBC to this man and his eccentric genius as a potential script writer. It is beyond me that he passes in relative obscurity and penniless. I hope his blog is left up for posterity but that it is legally protected for his family's sake. In the meantime I'm drowning my sorrows with pint after pint of Old Lesbian. This loss of such a great provider of warmth and merriment cannot be overstated. I've been struggling to find words to convey how shocked and sorry I am that this happened. My heart goes out to his family. Rob is missed so much by the blogosphere. 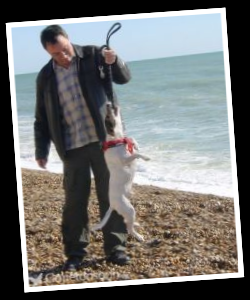 But I think Kev has it in remembering how great Mutley was and how he made us all smile. I too hope Mutley's blog is left up. I was shocked to read this sad news today too. He will be missed by a lot of people. The blogosphere has just become a much smaller place. Likewise, I will miss him greatly. I'd really like to have met him; the revelation that Folkestone was the real setting of the Bridport radioactive Howler monkeys, his gay neighbour Giles and all the rest of the wonderfully surreal cast of characters now neatly clicks into place. Damn that's a shame, some of his comments were inspired.